I wanted to update some current inspirations for the guest bathroom. I've discovered a few things that I'm considering blending together and I'm feeling good. Let me know your thoughts. 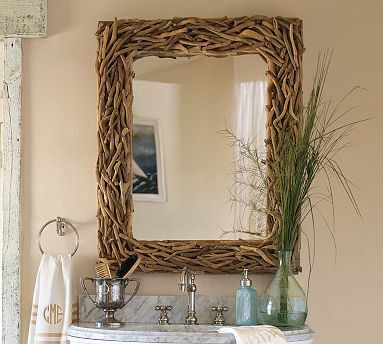 I have a new love..a large mirror framed by ash-colored (almost grey) wood that nearly over takes an otherwise simple bathroom counter. Not to imply that the bathroom counter design you've picked couldn't stand alone on it's own four legs. This is very chic and very gorgeous and your guests will feel very lucky whenever they use this powder room! What a beautiful space. 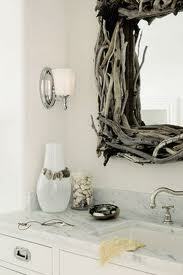 I LOVE that mirror Whit! Are you making that or buying it? 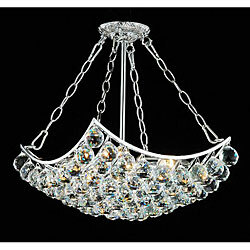 The chandelier is fabulous as well. You are going to do such a wonderful job making your space beautiful! Hi Danielle, I will in fact be making this mirror and I'll be sure to give a step by step .I am waiting for the wood that I purchased to come in. Unfortunately here in S Florida we don't get the drift wood that I need for it. Stay tuned. Thanks for stopping by.